Our goal is to give our users complete control of their funds and help them benefit from the new developments in the community. 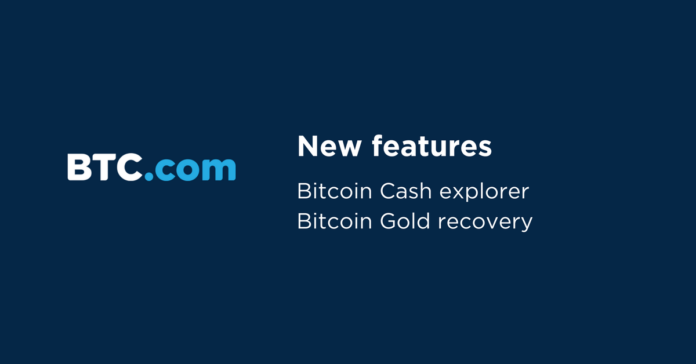 That’s why we have released two new tools: A Bitcoin Cash Explorer and the Bitcoin Gold recovery tool. When you own Bitcoin at the moment of a fork, your account will be credited with the new coins. However, you are only able to control what happens to your forked coins, when you own your private key. If you store your funds with a wallet that gives you your private key, you can access and transact with your funds at any moment. With the BTC.com wallet you have always access to your private keys, therefore you have complete freedom to manage your Bitcoin Cash, Bitcoin Gold or any other forked coins. This is the power of owning your private key and that’s why we highly recommend that you store your bitcoin in a wallet like BTC.com, which gives you the private key to your vault. Forgot to recover your Bitcoin Cash? After the 1st of August 2017, BTC.com wallet users with a positive bitcoin balance could recover their Bitcoin Cash. We are proud that our users were one of the very first to be able to enjoy this benefit. Since then, due to the huge demand, we made the Bitcoin Cash recovery tool available to users of other wallets as well such as paper wallets, blockchain.info, Jaxx, mycelium and many more. BTC.com wallet users, who had a positive bitcoin balance on the 25th of October, 2017 now have access to the same units of Bitcoin Gold via the wallet recovery service, enabling easy export of the BTG to an exchange or supporting wallet. To clarify, the wallet will not support BTG token natively and access to BTG funds is exclusively via the recovery tool. Please read more about it in our Bitcoin Gold recovery tutorial. For future forks, we will maintain a pro-active approach and support our users to safely access their forked coins. We want our users to keep up with the industry’s development and therefore we will continue to offer tools that allow you to get the most out of your digital currency in a secure and easy way. We’re proud to announce the release of our new Bitcoin Cash Explorer. Look up and control your transactions, find cool stats, and gain useful insights about the status of the Bitcoin Cash network in real-time. Get ready to explore the BCH blockchain at bch.btc.com!